Located in the heart of the ever so popular Palace Estate is this immaculately presented five bedroom end of terrace home. 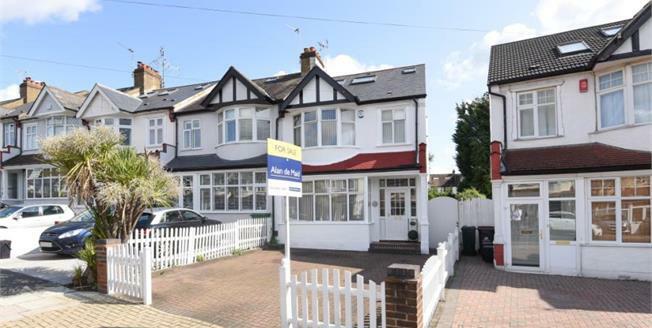 Superbly located for excellent local schooling and convenient for Bromley South mainline station and also Bromley town centre with its shops, restaurants, bars and leisure amenities. The property has been updated to a very high standard and offers over 1,300 sq ft. of spacious and neutrally decorated accommodation. The property comprises; downstairs cloakroom, a bright reception room with feature fireplace, separate dining area with patio doors leading onto a south east facing garden and kitchen with ample storage. Upstairs is the master bedroom with bay window, a further double bedroom, single bedroom and family bathroom. To the loft there are two airy double bedrooms both with built-in wardrobes and a shared modern shower room. Benefits to this property include off-street parking for two cars, side access and gas central heating. Viewing is highly recommended.